Devonta Freeman has just just been a man on a mission. He didn't score a touchdown last week, but he still managed to get about 130 total yards in the game. The man is a workhorse and it's tough to not keep him in the lineup. 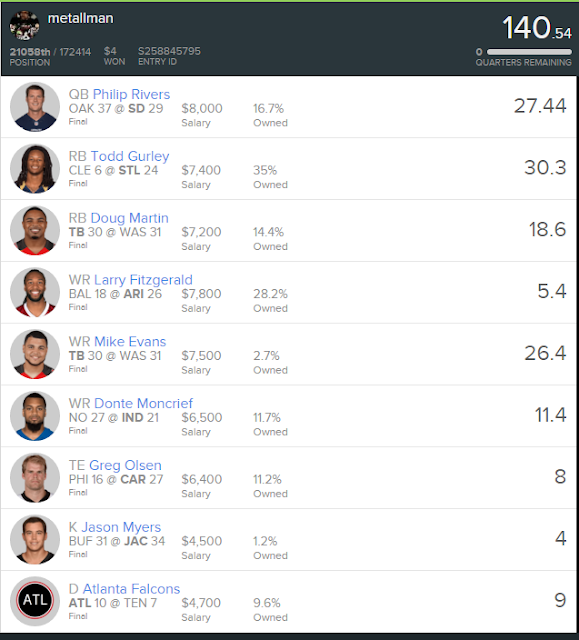 Also, aside from Mike Evans, my WR selections did nothing for me. Fitzy should have had a good game against the Ravens and it just didn't happen and Andrew Luck forgot he had receivers on his team not named Hilton. Moncrief managed an ok score on a TD but just didn't have much else going for him. The kid came up big last week coming up with 20.7 points! He has scored in double digits the last 4 weeks so he was bound to have a 20+ point game sooner or later. He and Bridgewater look to continue their strong chemistry against the Chicago Bears. I say the kid has another great game and ends up with 17 points against the Bears. Marvin Jones is beginning to turn heads in Cincy. Even though Eifert and Green get the most attention, Jones has been a solid contributor to the Cincy passing attack. Consider that most teams will have a game plan to stop Eifert and Green, not many are going to center around Jones. He'll be the second and third option and he has the play making ability to turn a short pass into a big gain. Pencil the kid in for another 17 point day against the Steelers. Houston had one of the ugliest first halfs that I have ever seen. They were getting beat down by the Dolphins and while I could write a whole article about what went wrong, I'm here to bring attention to the silver lining. Nate Washington had a hell of a game. Though it was a pass heavy second half, Hoyer targeted Nate more than the high priced Hopkins. If Cecil Shorts continues to miss time, look for an increased work load for Washington. Especially since news came out that Arian Foster is out for the rest of the year. Washington snatches 18 points this week against the Titans. Now... I was a bit reluctant to add a RB on this week's list. Personally, I would pay the higher price tag and nab a top tier RB (Gurly, Freeman, Bell, or Forte) but if you have to save salary cap and looking at the RB spot, McFadden might by your guy. McFadden is now the clear cut #1 guy in Dallas. The passing game is a joke at the moment and that offense is going to rely McFadden heavily. Though he might break out a long run or two against Seahawks, I think he'll be more valuable in the short passing game. He'll definitely be THE focal point and may actually end up in the end zone more than once. I say McFadden helps Dallas upset the 'Hawks and comes up with a big 22 points. So there are a few value picks that you may want to consider. 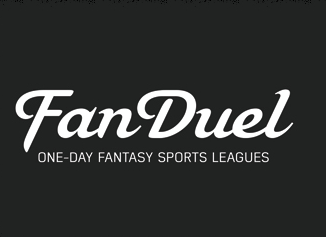 There are many Fantasy Football websites out there but I really like FanDuelt. If you haven't signed up, do so here. Good luck friends! Hope we all are a little richer when we catch up next week! Later!